While total sales volume has increased across our three major market segments, the number of transactions overall has dropped year-over-year (YOY) based on our 12 month rolling average. Well-priced properties continue to be absorbed quickly, while sellers who are being bullish are waiting longer to achieve their pricing goals. Listing inventories increased across most neighborhoods considered 'primary', however our inventory continues to remain low. 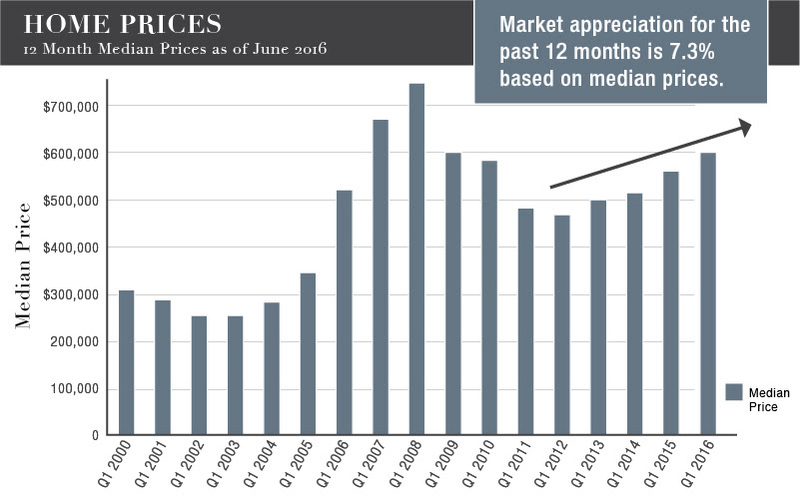 Price appreciation is healthy when measured against both average and median prices. Our market is highly segmented, so please contact me if you have questions regarding your specific neighborhood. 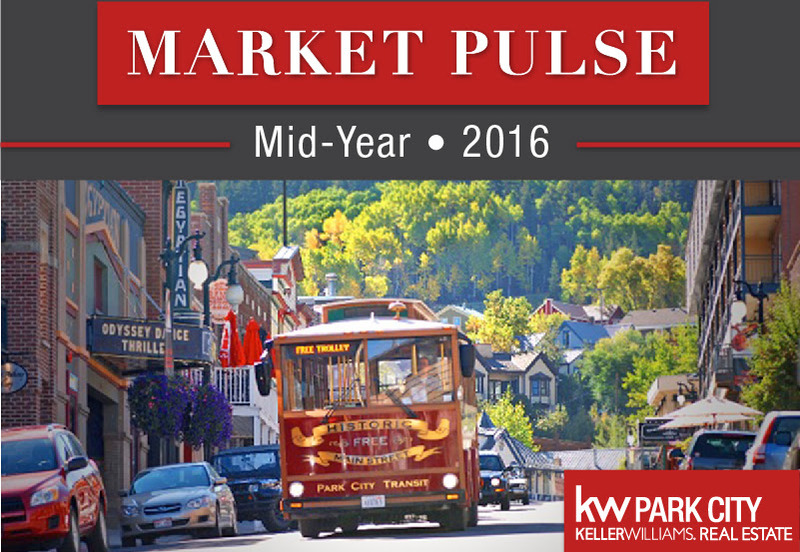 Within Park City Limits, the number of single family homes sold dropped 17% year over year. Total sales volume increased 11% to $377.3 million. The median sold price increased 19% to $1,582,000. In the Snyderville Basin, the total number of homes sold dropped 6% with 338 total sales, with a 16% increase in volume from $437.6 million to $505.8 million. The new median price shows a 10% increase and now sits at $938,500. 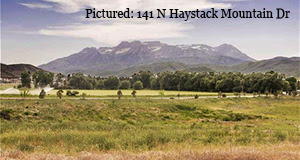 The Heber Valley is extremely active with a 35% increase in the number of sales. 311 homes were sold with total volume of $150.6 million, a whopping 49% increase. This drove the median price up 16% to just under $400,000. Sales of condominiums within Park City Limits showed a 27% drop in total number of sales to 285 with a similar drop in volume from $366.7 to $288 million (a 21% drop.) Despite this drop in the number of transactions, the median price rose 18% to $660,000. Snyderville Basin: The total number of sales increased 21%, with 369 sales in the past 12 months. Total volume increased 33% during the same period for a total of $181 million. This drove the median price up 12% to $429,000. Strong demand in the Heber Valley resulted in an 84% increase in total number of sales: there were 35 sales this past year versus 19 the prior year. Total volume more than doubled, with $9.5 million in total sales, a 105% increase year over year. The median price rose 8% to $222,000. Within Park City Limits, the number of land sales dropped 32% with a 20% drop in total volume from $29.5 million to $23.6 million. The median price rose 25% to $750,000. While just one more lot sold YOY in the Snyderville Basin, the median price jumped 29% to $412,000. The Jordanelle area has been extremely active particularly in land sales, where the number of transactions increased 118% YOY. The $36 million in total sales represents a 205% increase over the prior year, driving the median price up 54% to $320,000. 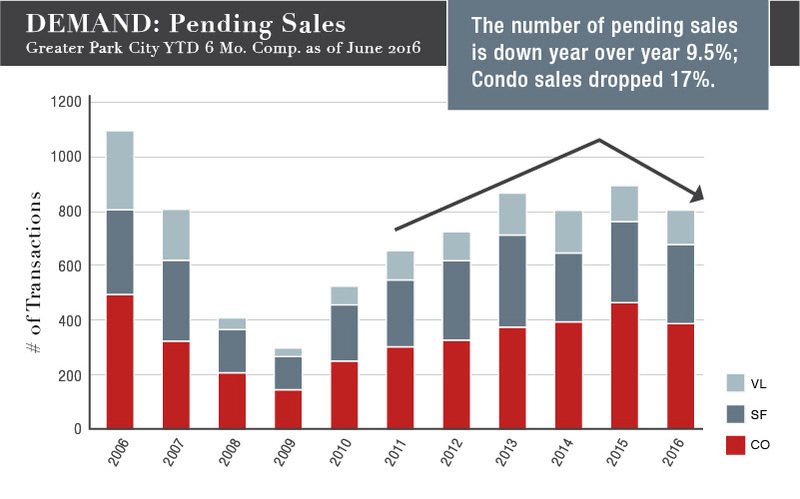 The number of pended sales is down year over year (9.5%) with the most notable drop in condominium sales, which dipped 17%. 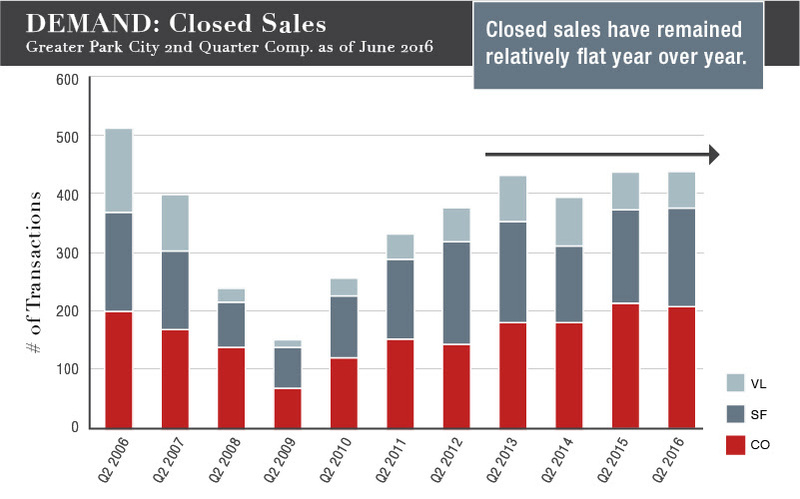 Closed sales have remained relatively flat year over year. 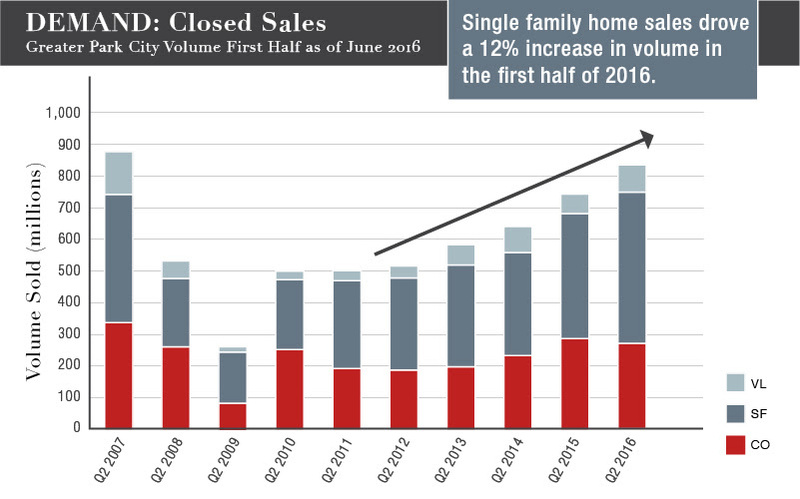 Single-family home sales drove a 12% increase in volume the first half of 2016. 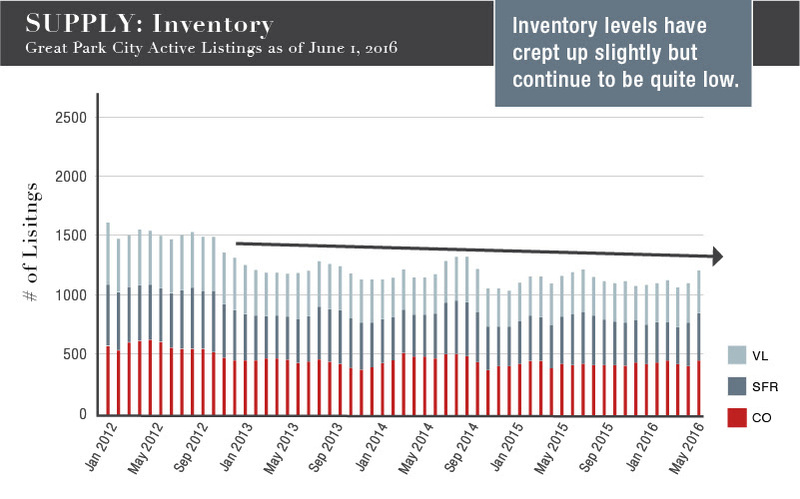 Inventory levels have crept up slightly but continue to be quite low. 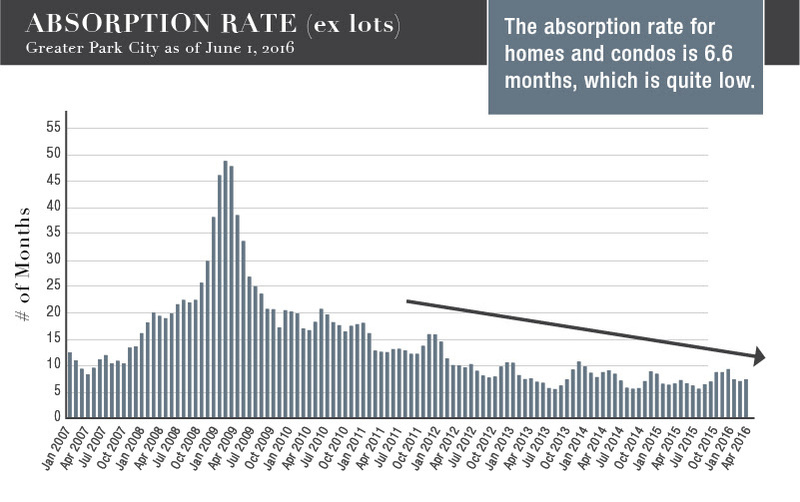 The absorption rate for home and condos is 6.6 months, which is quite low; our supply was at 9.6 months at the end of the first quarter. 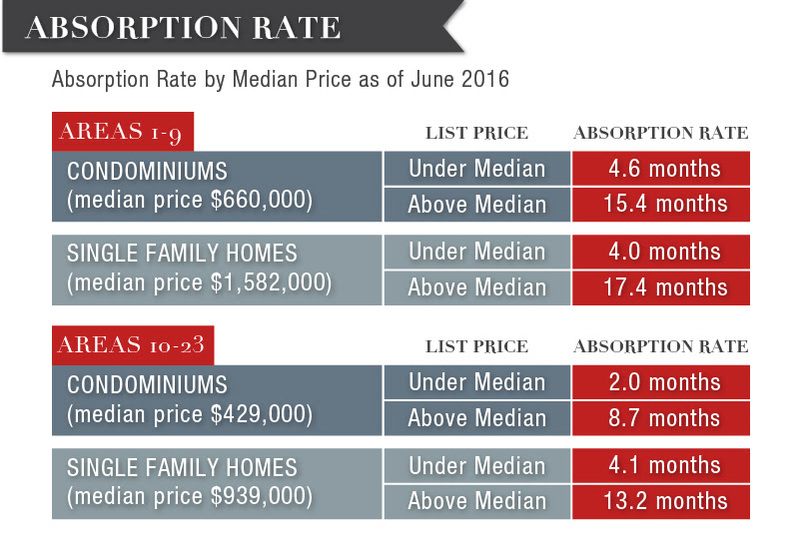 Market appreciation for the past 12 month is 7.3% based on median prices. 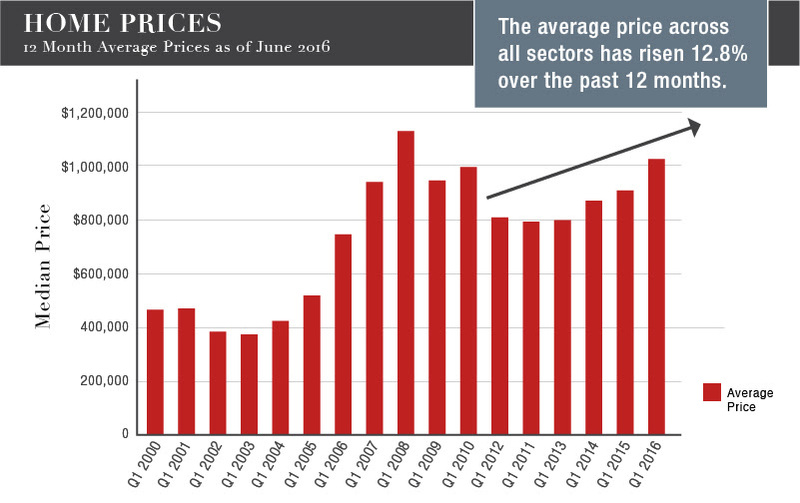 The average price across all sectors has risen 12.8% over the past 12 months. In Old Town, the number of homes sold dropped 17%. The 54 sales totaled $80.5 million in volume, an 11% drop over the prior year. The median price rose 8% to $1.3 million. Thaynes Canyon witnessed a 20% increase in transactions with volume more than doubling to $27.8 million (111% increase). The median price rose 58% to just under $2 million. In Upper Deer Valley, the number of transactions rose slightly (8%), however total volume was up 87% to $88 million (an 87% increase). The median rose 125% to $7.5 million. This was due to several closings at Stein Eriksen Residences and two significant outlier sales. In Empire Pass, the median jumped up to $8.3 million, a 41% increase with a total of 4 homes sold. Prospector homes dropped 29% based on transactions, with an almost equal drop in total volume. The median was only up slightly to $747,500, a 7% increase. Pinebrook saw the most significant increase in the number of sales in the Snyderville Basin, with an increase of 25% in transactions (45 vs. 36 the year prior.) Though volume rose 32% to $38.4 million, the median actually dropped slightly (3%) to $755,000. Glenwild/Silver Creek: Transactions dropped by 23% while the median price rose 39% to $1.7 million. Home sales increased slightly inPromontory, with a 7% increase in the number of transactions. Total volume jumped 34%, resulting in a 19% increase in the median price, which is now $1, 850,000. Jordanelle continued to be an attractive area, with a 39% increase in the number of home sales. In total, 39 homes were sold this period resulting in a 79% increase in volume. As a result, the median price jumped 42% from $838,132 to $1,190,000. Home sales have also been brisk in the Heber Valley, with an increase of 80 transactions year over year, or a 35% increase. Total volume was up 49%, driving the median price up 16% to just under $400,000. The number of condominium sales year over year dropped 27% within the Park City limits – there were 285 sales totaling $288 million versus 390 transactions for the prior period. The median price rose 18% to $660,000. with a 33% increase in total volume to $181 million. The median price rose 12% to $429,000. The majority of this increase occurred at Canyons Village, where transactions rose 22%. With 110 transactions, the median in this area rose 39% to $542,000. In the Heber Valley, total transactions jumped 84%, driving the median price up 8% to $222,000. Midway/Charleston showed the greatest increase, with 67% bump in the number of transactions. The 30 sales in this period resulted in $8.3 million in sales; the median condominium price is now $277,500, up 37%. Within Park City Limits, the number of lot sales dropped 32%. In total, 25 homesites sold at a median price of $750,000. This represents a 25% increase, which is not surprising given the scarcity of building lots within the city. In the Snyderville Basin, the number of transactions was flat, however the median increased 29% to $412,000. The Canyons saw the greatest increase in the number of transactions, with a 41% increase. The 24 sales there drove the median up 19% to $1,900,000, with the majority of these transactions occurring at The Colony at White Pine Canyon. Glenwild/Silver Creek were also active in lot sales, with a 26% increase in the number of transactions. In total, $15.5 million in sales across 34 sales were conveyed, resulting in a 19% increase in the median to $475,000. The Jordanelle continued to be very popular for building sites, with a 118% increase in the number of sales, from 40 to 87. The median price rose 54% to $320,000. 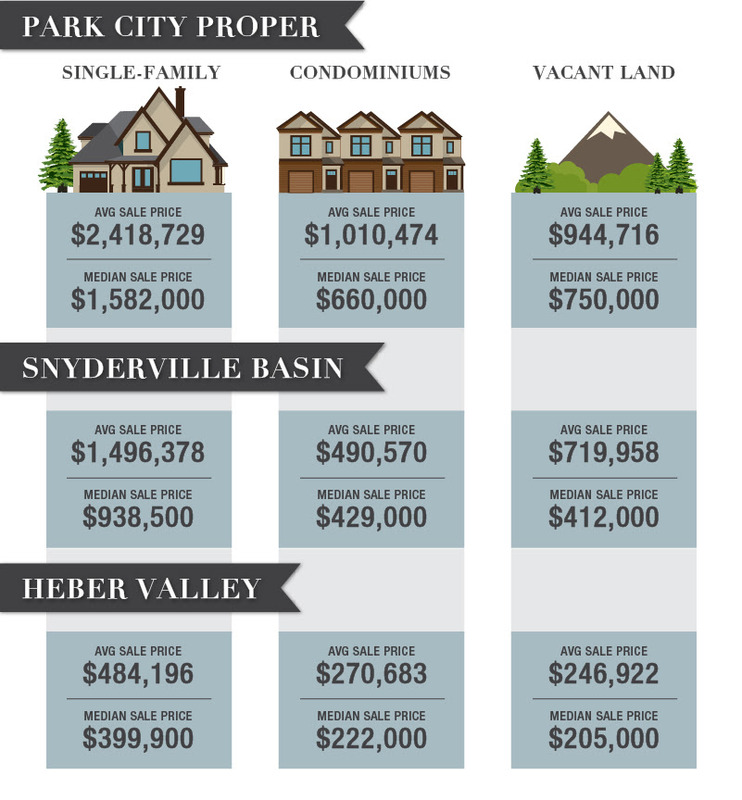 In the Heber Valley, sales of lots dropped slightly, while the median increased 5% to $205,000. 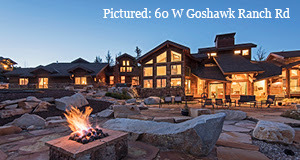 If you would like to discuss buying or selling homes, condos, or land in Park City please feel free to call me.